Chef Brandon McGlamery will be teaming up with Chef/friends, James and Julie Petrakis, along with several other special guest chefs, to cook up an unforgettable four-course Whole Cookery Feast featuring southern inspired dishes guaranteed to delight your taste buds. 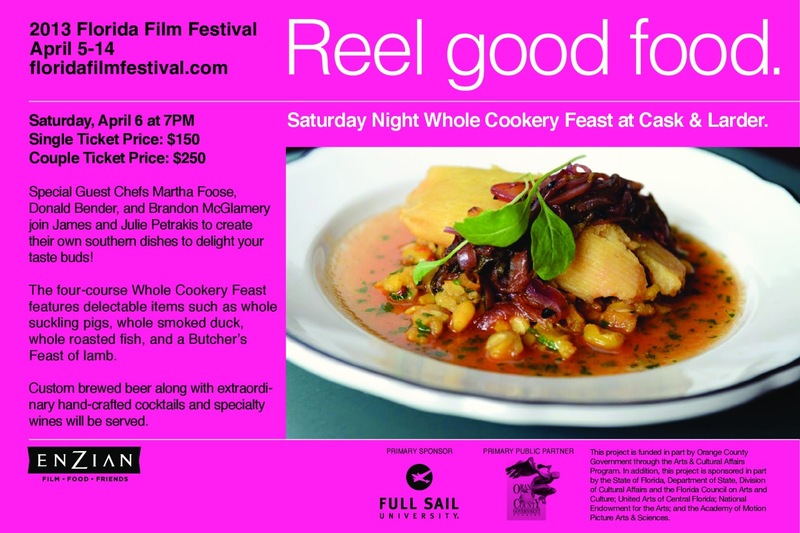 Take part in the 2013 Florida Film Festival fun and join us at Cask & Larder on Saturday, April 6, 2013 at 7pm. Don't miss this opportunity to enjoy an evening filled with custom brewed beer, hand crafted cocktails, specialty wines along with delectable food and great company! For more information or to purchase tickets, please visit Film & Food Celebration.